NEW ORLEANS — For the fifth time in the past eight years and the third year in a row, the Oregon Ducks swept the NCAA Division I Program of the Year Awards. 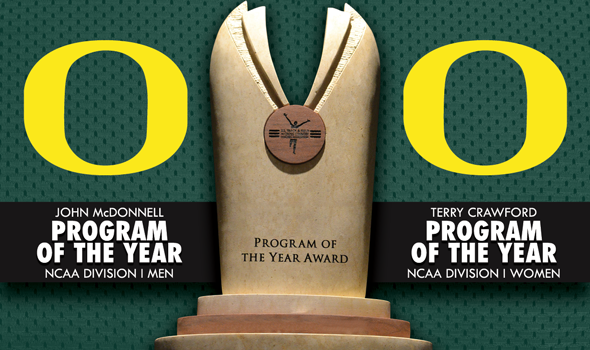 The Oregon men captured their fifth John McDonnell Program of the Year Award, given out to the top men’s program from the previous academic year, while the Duck women earned their eighth consecutive Terry Crawford Program of the Year Award, bestowed upon the top women’s program. It wasn’t a runaway victory for Oregon’s men as it had been in years’ past. Entering the NCAA Division I Outdoor Track & Field Championships at Hayward Field this past weekend, the Ducks led runner-up Arkansas by three points in the standings. Scoring is based on the team’s finish at each NCAA Championship in cross country, indoor track & field and outdoor track & field (i.e. 1st = 1 point, 2nd = 2 points, 31st = 31 points) with the lowest total score determining the award recipient. So for Oregon to three-peat, it had to finish no worse than fourth on its home track and hope the Razorbacks didn’t win the outdoor title. When the dust settled, the Ducks found their way on the podium (fourth place) and Arkansas finished six points back of national champion Florida and had to settle for second place. Oregon won the John McDonnell Program of the Year Award by one point (9-10) and still would have had first place locked up if there was a tie. With the precedent set in the race for the NAIA Women’s Program of the Year, the Ducks placed better than the Razorbacks at two of the three championships. Finishing behind Oregon and Arkansas in the John McDonnell Program of the Year Award standings were Stanford with 25 points, Washington with 33.5 and Virginia with 37.5. Looking at the women’s standings, Oregon’s reign was never in doubt after Robert Johnson’s team won the indoor championship. The Ducks entered the outdoor season with a seven-point lead on the competition following a third-place effort in cross country and a team title indoors. Despite being short-handed at the final outdoor meet, Oregon rallied for a runner-up finish behind national champion Arkansas. Freshman sprinter Ariana Washington scored 21.5 of the Ducks’ 62 points on their home track (double winner at 100/200) to lead the way. The only way Oregon would not have won the Terry Crawford Program of the Year Award was if it took a nosedive, finished eighth or worse and the Razorbacks won the team title. Well, it’s safe to say the only thing that happened out of that equation was Arkansas being national champion. Oklahoma State finished a very distant third behind the Ducks and Razorbacks in the Terry Crawford Program of the Year Award standings with 29.5 points, while Michigan (32.5) and Stanford (37.5) rounded out the top-5.